Home / Black Mormon History / Bruce R. McConkie Wrote Official Declaration 2! 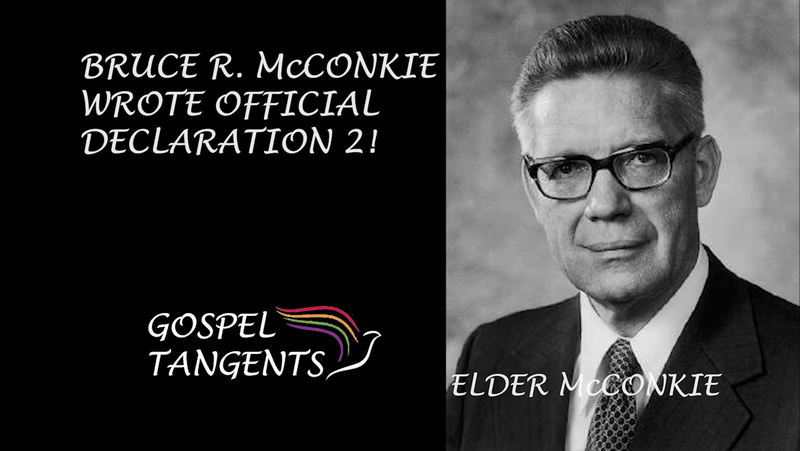 Bruce R. McConkie Wrote Official Declaration 2! We will also discuss a candid discussion between President Kimball and an official from the Carter Administration, who expressed displeasure with the ban. Did you know Elder McConkie wrote Official Declaration 2? Previous post: I need your help! There was no Carter Administration in 1976, and Jack W. Carlson (Ph.D., Harvard, Economics) wasn’t a Democrat. He was a Republican who served in the Ford administration. He lost the 1976 Utah GOP senatorial nomination to Orrin Hatch. During the Carter administration, Carlson was President of the U.S. Chamber of Conference, which is a lobbying group, and then executive vice president of the National Association of Realtors. Very interesting! I’ll have to check with Matt on that, because he dated it from ’75-77 which would have overlapped Ford and Carter administrations. I know he was a but fuzzy on that. It is not ironic that McConkie wrote it. It only shows that he was not the one dimensional charicature his critics make him. Mormon Doctrine only echoes teachings of others on the matter. BRM went to the original sources, the scriptures, and found support for lifting the ban which he shared with SWK. His son never credited BRM for this revelation, he only showed that he was supportive of it and helped prepare SWK to receive it. Otherwise a good interview. I just hate the constant attacks on BRM. Why not praise him for being one of the first to get behind the prophet and seek for revelation to change the policy? Why try to pin a policy on him that was started decades before he was born?